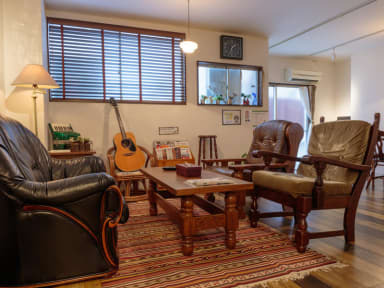 Wonderful place to stay in Hiroshima. I'd also recommend it to those people who usually don't like staying in hostels. If you don't mind sharing the bathroom (which was clean and well equipped including hair dryers), you can have a nice double room to yourself. Since there were several shower rooms and toilets there was no waiting time. 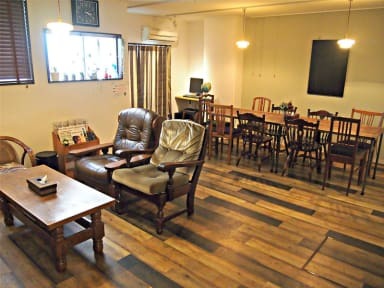 The central location of the hostel is good for both visiting Hiroshima's Peace Memorial and Miyajima. The staff was very nice and always ready to help. Absolutely great stay! Important for me, they have filter coffee there! This hostel was just amazing! Only a short walk to the most important places and amazing to get to know new people because of the nice common room! The kitchen is big and the rooms are especially nice because everyone has a lot of room in the bed bunks! The staff is nice and everything is super clean! We would definitely stay here again! An really good hostel! I would go there again. Location is perfect to visit the peace park. One of the cleanest hostels I ever went to ! So many details that makes your stay even more comfortable. Nice living room with sofas and kitchen. Around 7 min walk to Atomic bomb Dome and other sights, 35 min walk to osaka station. Really enjoyed staying there ! Hardly recommend it to everyone! Sehr gut gelegen.das Personal war netter als nett und die sanitärenären Anlagen waren mehr als ausreichend. Die Zimmer sehr Atmosphärisch und nett eingerichtet. Everything clean. Good Location and very friendly and helpful employees. Beautiful common room. Nice dorms with the feeling of private space. I'd stay again. I really liked the hostel: good location, freindly staff, nice common room. The only downsides were the very thin walls (you could here everything), washing sink was on the floor (no seperate room to have a bit of privacy when washing) and the matresses were in japanese tradtitional style, so that it felt like sleeping in the floor. Good for staying in footwalk distance to Hiroshima Heritage Sites. Staff very friendly and helpful.